In high school, Michelle Cortez never understood why she’d been placed in certain classes at Granite Hills High School. Most of the other students in her classes had severe disabilities. They’d go on field trips where they’d learn skills like how to use a bus or eat at a restaurant. When Cortez talks about the classes, she often refers to herself as a TA, since much of her time was spent helping her classmates. In 10th grade, she began to suspect something was wrong. She had gotten As in her ninth grade math classes, but was placed in the same classes again in 10th grade – this time for credit only. She went through high school without taking a single history or geography course. Her suspicions were confirmed in a heartbreaking way not long after she finished high school. Cortez had her heart set on going to the Universal Technical Institute in Long Beach, which offers technical training in the automotive industry. Her father worked on lowriders growing up, which fueled her dreams of being an auto mechanic. That career plan was even documented in her individualized education program – a document that lays out the goals and needs of students who qualify for special education services. So it was a shock when she arrived at UTI in August 2017 with her father for orientation, and was told she would not be able to attend. She hadn’t earned a high school diploma, but instead was given a certificate of completion – a document given to special education students who are deemed unable to earn a diploma because of their disability. With the help of Donna Ciatti, a special education teacher who became the family’s advocate, the Cortezes discovered just how badly the school system had failed Michelle. Her designation as having a disability was precarious from the start. By high school, it had robbed her of a quality education. When Cortez was in first grade in the Cajon Valley Union School District, she was evaluated for a learning disability because she was having difficulty reading and writing. Cortez spoke primarily Spanish at home before she began school. The team that evaluated her determined that because other factors could be contributing to Cortez’s struggles in school – specifically that Spanish was the primary language spoken at home and that she had a high number of absences – she didn’t belong in special education. But the next year, another evaluation took a different turn. As in first grade, all the testing was done in English. When evaluators outlined Cortez’s struggles, they noted problems with pronouns and verbs – common issues for Spanish-speakers learning English. But this time, the fact that English was Cortez’s second language wasn’t highlighted as a possible reason for her academic struggles. The evaluation didn’t even even note Spanish was her primary language. Instead, evaluators determined that Cortez had a severe expressive language disorder. Marta Leyva, a bilingual special education advocate who works with parents and students in San Diego County, said that tests that aren’t conducted in the student’s primary language can set them up to perform poorly. Leyva did not work with the Cortez family, but independently reviewed Cortez’s evaluations, individualized education plan and transcript for Voice of San Diego. The Cajon Valley School District declined to comment on Cortez’s case, citing privacy issues, but did respond to some general questions about how it evaluates English-learners. Jenine Henry, the director of special education in the district, said that not all English-learners are evaluated in their primary language. Every three years, Cortez was reassessed for her disability. 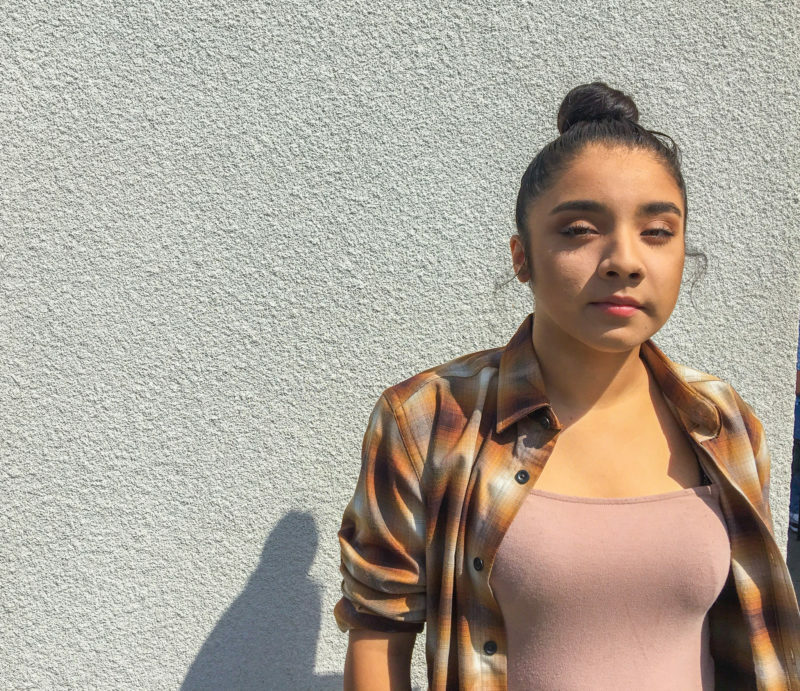 Her fifth, eighth and 11th grade evaluations noted that she’s a bilingual learner, but continued to reinforce that she had a disability. Cortez’s educational files, provided to VOSD by Ciatti and the Cortezes, indicate that once she was placed in a severely modified high school curriculum for her disability, she was no longer exposed to services to boost her English proficiency. The files show that beginning in high school, Cortez was exempted from the California English Language Development Test – a test that measures English-language proficiency that was given in California until recently. Several experts who study and work with English-learners considered to have disabilities say it’s not unusual for schools to mischaracterize English-learners who struggle in school as having a learning disability. “The issues are complicated when you have students who are in an English-only program,” said Alba Ortiz, a professor emeritus at the University of Texas at Austin who specializes in special education and English-learners. Putting students for whom English isn’t their first language in English-only classes can create a vicious cycle: The students struggle to learn in English, and teachers therefore believe they have a disability, Ortiz said. To ensure English-learners aren’t mischaracterized, schools should be collecting other types of data, she said. For example, do their parents say the student doesn’t understand them at home when they interact in their primary language? Experts also believe that English-learners like Cortez shouldn’t be compared to native English speakers, but to other students in their age group who are also learning English and have the same level of English proficiency. Cortez’s fifth grade assessment notes that she was still testing in the beginning level range on English-language assessments, and that her scores hadn’t changed since kindergarten. That could have been an indication that she had a disability, which was her school’s reasoning. Hoover said that if students aren’t getting the interventions they need – for example, if they are struggling because of a lack of English proficiency and don’t receive additional assistance in that regard – their scores will plateau or fall. Samuel Ortiz said that on average, English-learners need a higher average IQ than students whose primary language is English to make it through the school system because of the additional obstacles they face. That can result in English-learners who have average or low-average IQs struggling in school and even being misidentified as having a disability. Unfortunately, Samuel Ortiz said, what happened to Cortez isn’t a one-off horror story. Nationally, English-learners are far more likely to be identified as having a specific learning disability. 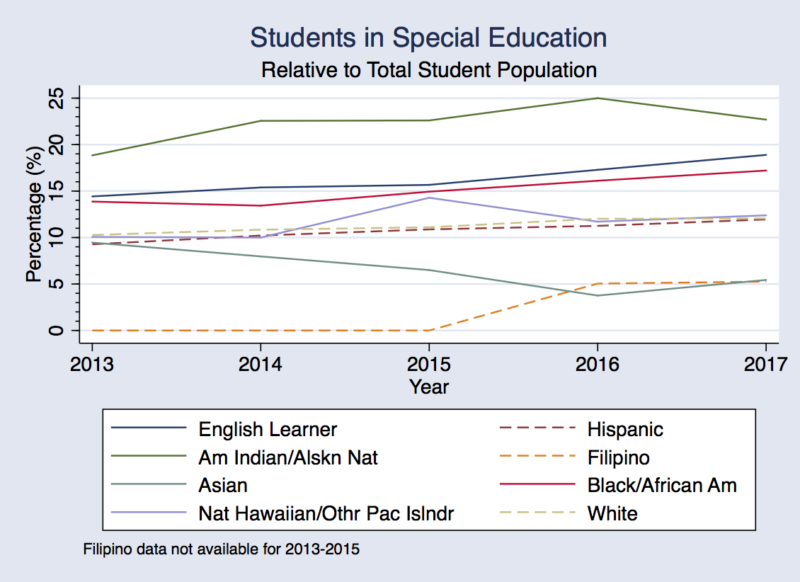 At Grossmont Union High School District, data shows English-learners are more likely to be placed in special education that many other student subgroups. At this point, it’s impossible to tell with certainty whether Cortez has a disability. She likely wasn’t given the tools she needed to succeed in school as an English-language learner – regardless of disability-status, English-learners have much lower graduate rates and much high dropout rates than the state average – and she was consistently given coursework below her potential. A mix of inappropriate teaching for a bilingual student and low expectations may have led her to manifesting a disability as her educational career went on. But her evaluations and assessments contain many of the errors that experts who study the misidentification of English-learners say are common, and that should have made the evaluations invalid. Only in her first grade evaluation did school officials acknowledge that Cortez’s academic struggles might have been a result of her many missed classes and her status as an English-learner. Once she was identified as having a disability, the experts who reviewed her case said, she was placed on a path that made catching up to her classmates virtually impossible – and where the expectations for what she might achieve continued to drop. In 10th grade, when Cortez realized her schedule was oddly similar to the year before, she said she went to her dad, concerned she’d been placed in the wrong classes. Her father approached the school with the concerns and requested she be removed from the classes she’d already taken, according to a due process complaint filed against the district. The district declined the request. The following year, she was placed in a class called “Community Development,” which is designed to teach basic life skills like shopping and cooking, according to the complaint. Most of the other students in the class had severe disabilities, Cortez said. Cortez had an average IQ and nonverbal intelligence, according to the complaint. She was found to have a learning disability because she struggled with reading, auditory processing and expressive language. But she was placed in a program for students with moderate to severe disabilities, which includes severe autism, deaf-blindness, intellectual disabilities and serious emotional disturbance. 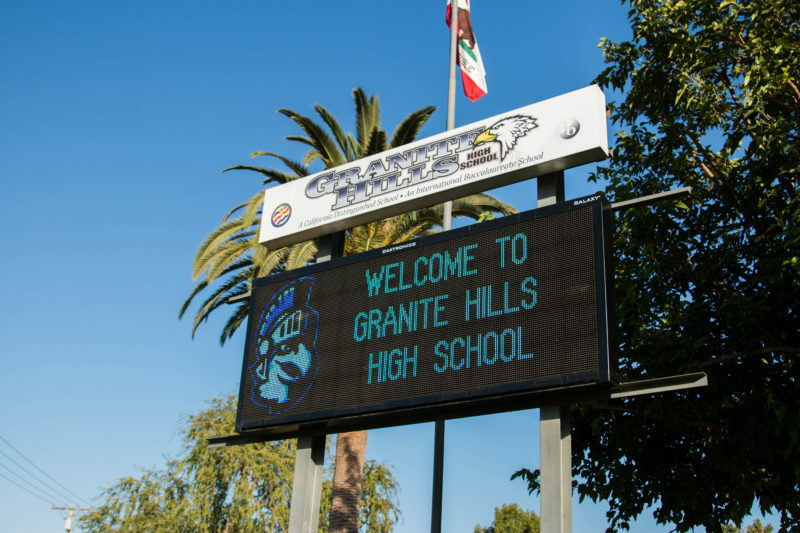 Grossmont Union High School District declined to comment on Cortez’s case, citing privacy concerns, but said that in general, parents and school officials meet to determine classes and goals for students with individualized education programs, and that changes are made annually or more often if needed. Cortez wasn’t the only student impacted by these issues – in fact, she wasn’t even the only member of her family who dealt with them. Jacqueline and Elizabeth Cortez, Michelle’s older sisters, both have similar-looking high school transcripts. Both repeated the same math class every year despite having passed it initially. Both were put into classes that aimed to teach them basic life skills. 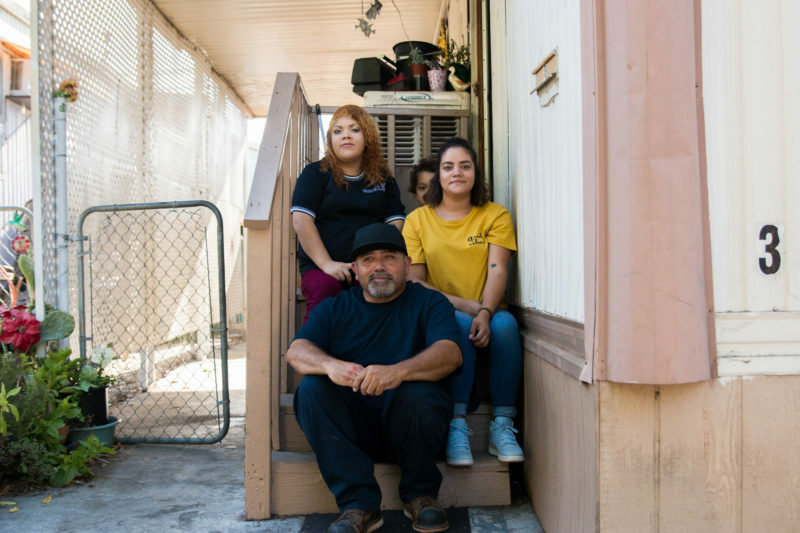 With the exception of a handful of classes – Michelle was able to take biology and algebra, Elizabeth and Jacqueline took a couple of social science classes – the girls’ schedules look effectively identical. Under federal laws governing special education, students are supposed to be placed in the “least restrictive environment,” which means to the maximum extent appropriate, special education students shouldn’t be removed from regular classes unless they could not succeed in those classes even with supplemental aids and services.Nationally, the percentage of students who spent less than 40 percent of their time inside general classes was at 14 percent in 2015 – the year with the most recent data available, according to the National Center for Education Statistics. The year Cortez graduated in 2017, 922 of 2,578 – roughly 35 percent — of students in special education in the Grossmont Union School High District spent more than half their time outside of general education classes, according to data provided by the district. Things turned out OK for Cortez. She currently works full time in auto repair, her goal since she was a girl. Ciatti said that she went to the district after Cortez was turned away from UTI and managed to get Cortez her diploma. Her transcript has been modified to say she received a diploma, despite her coursework not meeting the requirements. For her sisters, things turned out differently. They both went into the district’s adult transition program, in which students in special education can stay until they are 22, to help them transition to life after high school. They both are unemployed and living with their father. As they’ve watched Michelle’s case play out, the whole family wondered what their lives might look like if Jacqueline and Elizabeth had been given an opportunity to obtain a diploma. Jacqueline Cortez likes to work with animals and wants to work in an animal shelter. Elizabeth Cortez likes caregiving and working with older folks. But they say they have trouble getting even the most basic jobs because they have only certificates of completion, instead of diplomas. Ciatti has spent the past year and half dedicated to the Cortezes’ case. She’s filed dozens of complaints with the federal, state and county governments. She filed a civil case against the district. Michelle Cortez separately received some funds to be put toward compensatory education through a due process complaint. But Ciatti and the family want to see systemic change. The family wants to ensure all students get a chance to reach their full potential.